1) Okay, I don’t get much in the way of free beer in the mail. Not that I expect any sympathy from you because, hey, I still probably get more beer freebies than you. But still, people expect that I’m drowning in free beer, that the postman is weighed down with all the bottles he’s delivering every day and the recycling bin makes that telltale clinking noise on collection day. Well it’s not true (except the clinking bin part, that’s true). I get way, way, way less beer samples than anyone would expect. Like, barely enough to fill two slabs – and that’s including mainstream stuff. But it doesn’t bother me as much as it used to. 2) When I do get some free beer it’s usually accompanied by a press release printed-out on someone’s computer. Nothing wrong with that – it’s what I’d do. But Pia, who handles some marketing for Nail, went quite a few extra yards. That’s the release she sent in the photo above. As you can see, it’s handwritten. And that’s genuine handwriting too – not some insanely high-tech handwriting printer. And it’s nice handwriting too. 3) I don’t know how many of those Pia had to write but I’d guess it was more than one. And, honestly, I wouldn’t have even gotten that far before saying ‘‘bugger this for a game of soldiers’’ and typing the release out. 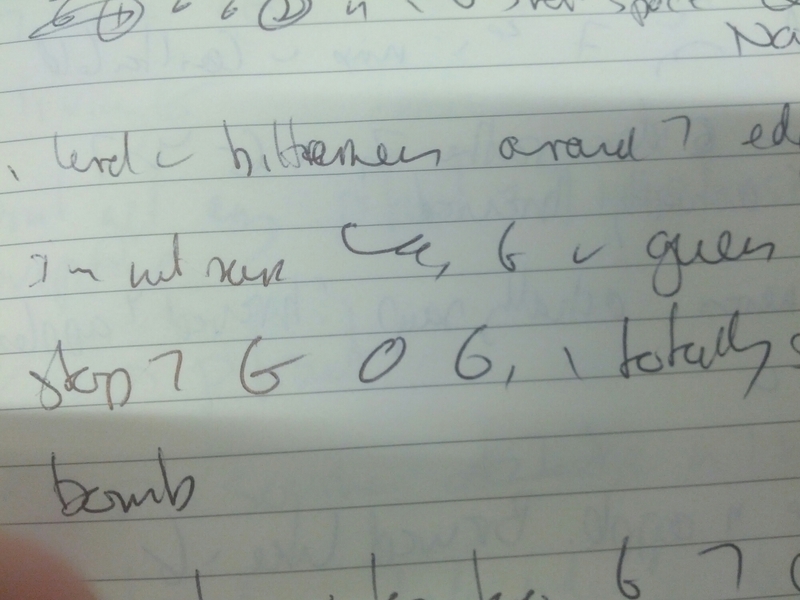 But that may be because my handwriting is rubbish. 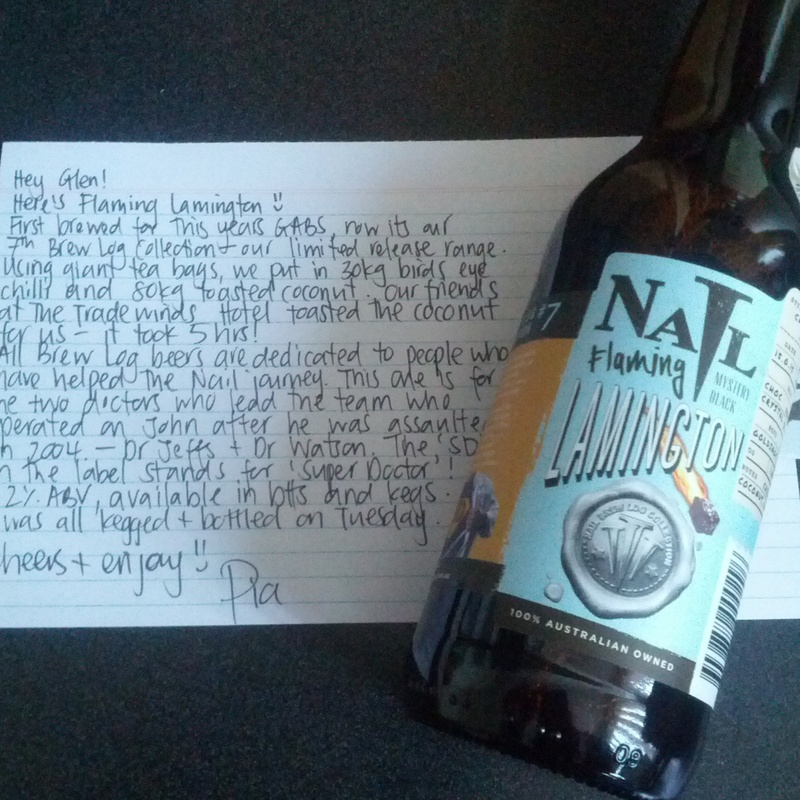 4) The handwritten release is for Flaming Lamington, Nail’s beer for this year’s GABS and now forming part of their limited edition Brew Log collection. It features 30kg of bird’s eye chilli and 80kg of toasted coconut. And where the idea came from to make a beer that tastes like a lamington but with chilli is something I do not know. 5) Not being a chilli fan and a bit unnerved by the weirdness of the combination, I wasn’t that confident about the beer either. But it works. I don’t know how but it works. The chocolate and coconut notes dominate, with the chilli just there in the background. The more I drank, the more pronounced the chilli became – but that may have also been a cumulative thing. So while it sounds like an unusual beer, it doesn’t taste like one. And I hop that sounds like a compliment, because it is. Free or paid for? : Well, as you might have guessed by reading the post, this beer was a freebie.